Give us your views: complete the survey form here. The Armoury in Roseburn Park was built as a signals report centre for WW2, as part of Air Raid Protection (ARP) measures for civilians against Nazi bombs. Its history came to light a few years ago when Friends of Rosebun Park (FoRP) uncovered a documentary made during the war featuring the building. The film, entitled “The Message Must Get Through” shows how the Armoury served as the nerve centre for squaddies on bikes coming from all parts of the city. In pre-internet days, when even the telephone service was relatively new, messages were carried by hand. 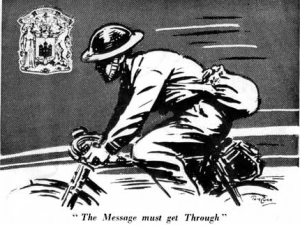 Cycling found huge favour in the 30s with cycling clubs established throughout the land and so it was only natural that it became the most reliable and economical way for soldiers to bring messages of bombs hitting Edinburgh, the better to co-ordinate emergency measures. 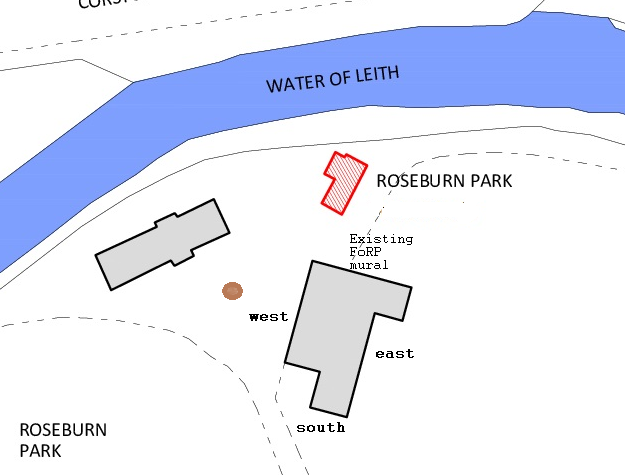 Rosburn Park, then as now, was easily accessible by bike and this location was the natural choice to build a report centre for ARP measures. It may be that this particular site was chosen under the trees to help protect it from Luftwaffe spyplanes and bombers. The Armoury is of national significance, because it’s the only surviving example in Scotland of an ARP HQ building. The survey FoRP carried out in 2016 is available here. It asked residents what they wanted to see in the park, and FoRP have been addressing those suggestions which found favour. Twelfth on the list was “Sculpture trail or other improvements along the river “corridor” from Roseburn to Saughton Park” – this drew 67% who loved or liked the idea, with 26% saying they didn’t mind it. Only 7% doubted or disliked the idea. When the Council announced it was seeking bids to its local events fund in January, FoRP thought a mural like this would reflect the building’s uniquely well-documented history. A grant was secured of £3,000 for a mural on the Armoury wall(s), to be produced by ZAP Graffitti of Liverpool. The artist, Kieran Gorman, did the FoRP mural on the north Armoury wall with young people back in 2012. He is from Livingston and lived in Roseburn before moving south.The next mural will be as different as we want it to be. He will be working this summer with both old and young on this project (with the accent being on those aged 50+) to explore designs for the mural. Everything is up for negotiation; even which wall(s) the images will feature upon (see below). We want the people of Roseburn to help shape this mural, especially the park users. Note the venue does not have wheelchair access. If you are a wheelchair user, view the film at the link above and if you want to do more, register your interest in the project on the survey form (see below). The film lasts 30 minutes; there will be a talk and discussion about the mural afterwards. Bar available and children welcome. Admission is free; tickets are available from Art et Facts at 19 Roseburn Terrace and online here. FoRP seek to consult the community as to which walls on the Armoury will be muralised and what the designs should feature. The detail, we shall work out at a brainstorming workshop to be held in Roseburn, on Sat 15th June. If you want to attend that workshop, please attend the screening, add your name at the end of the survey form, see below or note it on the paper survey form. Consultation will be done primarily through a survey of views, both online and using paper forms. The big questions are – which wall(s) do we want the mural on? Do we want it in black and white, sepia or in colour? Do we want several discrete images or one big image or a big image with different parts (like the existing mural)? We could even have a small image on each wall, as if they were “windows” into the building as it was 80 years ago. To give us your views, please complete the survey form here. Paper survey forms are available from Art et Facts at 19 Roseburn Terrace or at our local screening. The survey will close on the 12th June and the results will be published here on the 14th June on the FoRP website, on our Facebook page, at the workshop and at the Murrayfield Community Council meeting on the 25th June.